The mystical splendor of Australia emanates from the timeless land and sea, captivating visitors and locals alike. 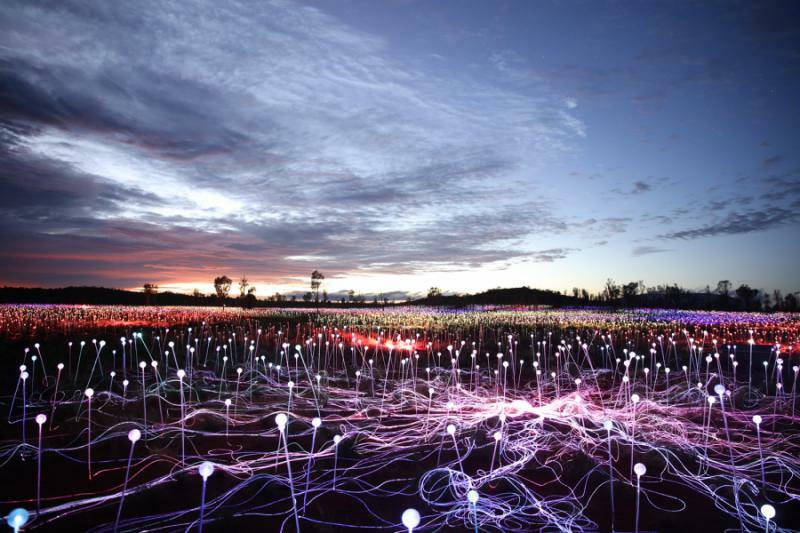 On this custom tailored "Field of Light" tour, experience 50,000 lights slowly illuminate the Australian skyline, a remarkable exhibition produced by world renowned artist Bruce Munro. 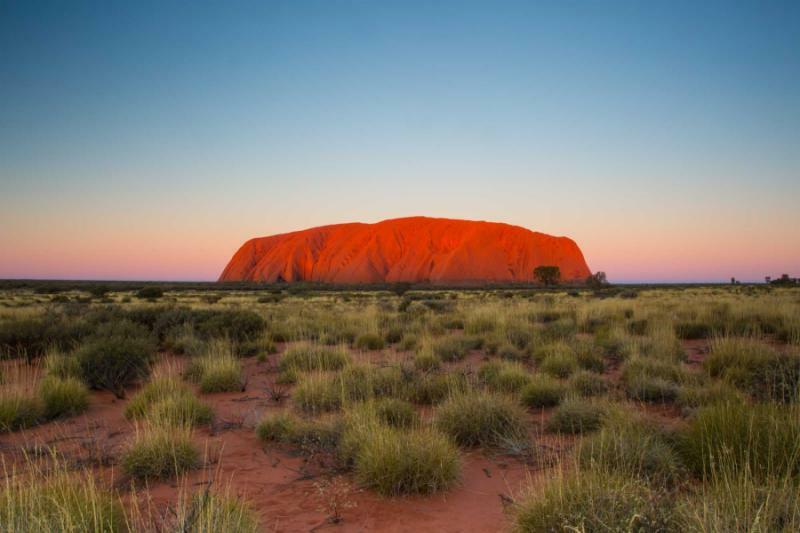 Tour the majesty of Uluru and the wonders of the Great Barrier Reef, the cosmopolitan culture of Sydney and the traditions of an Aboriginal tribe set deep in the rainforest of Queensland. The gentle humming rhythm of the didgeridoo overtakes the sound of the ocean lapping against the beach. Ancient rock art persists against the red façade of Uluru and cassowaries roam through the forest underbrush. Fish glow in the transparent blue Pacific. 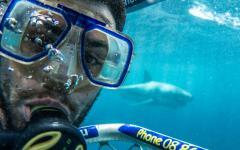 Australia’s unique allure is boundless. 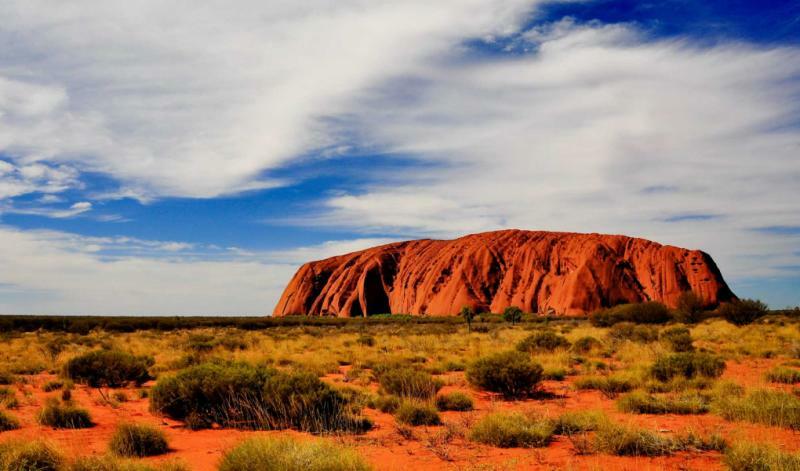 Book by June 30, 2016, and your domestic flight to Uluru ($150 value) will be complimentarily covered! Experience the unparalleled natural splendor of Australia on your 13-day vacation of Sydney, the Red Centre, and Queensland. 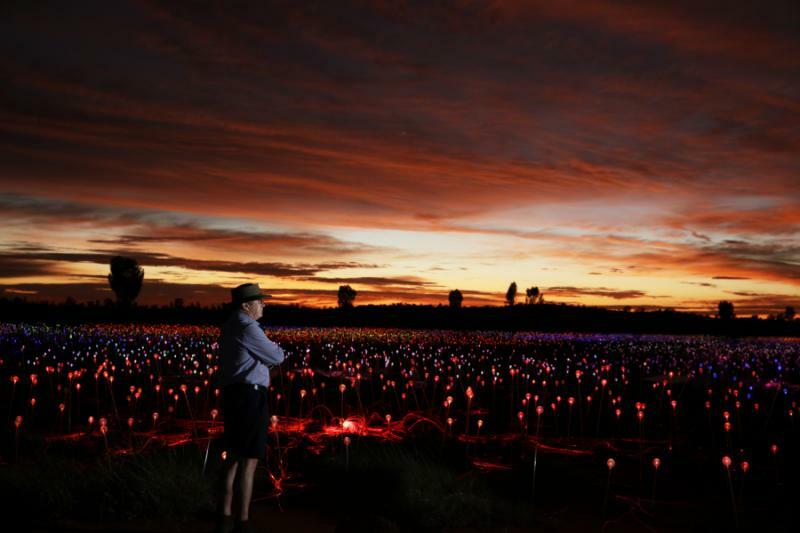 This tour takes you to the heart of the desert by offering you a complimentary flight from Sydney to Ayers Rock to discover the Field of Light and its connection with the landscape, sculpture, and tradition. Your journey begins with your arrival in Sydney. 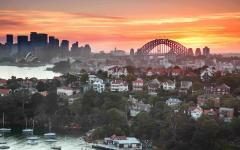 Your transfer greets you at Sydney Airport and takes you into the heart of the city to an opulent hotel. The following day, you can enjoy the city on a remarkable sightseeing tour, visiting the Sydney Opera House and the elegant streets of Paddington. Next, traverse the seas, utilizing the hop on, hop off cruise system that could take you from Darling Harbour to Garden Island. You could even explore Manly, where you can stroll along the incredible coastal walkway. 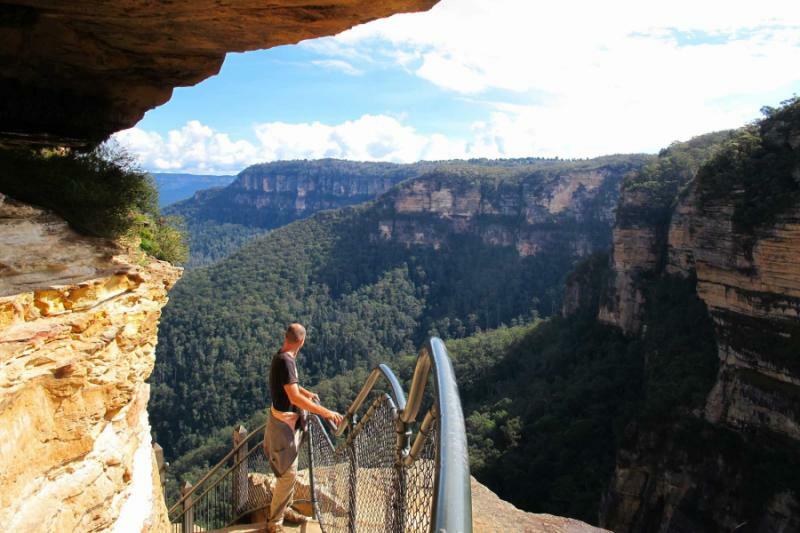 You make your way outside of the city to witness the stunning scenery of the Blue Mountains. 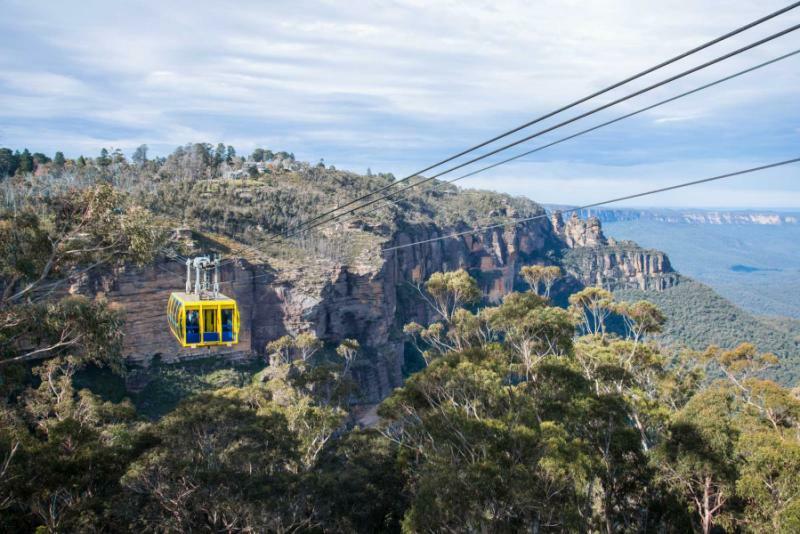 See the Three Sisters, visit the crisscrossing trails underneath the forest canopy, and travel on the steepest railway in the world. 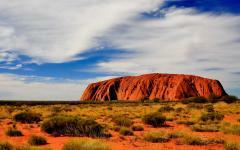 Then, relish your complimentary flight and fly directly to Ayers Rock, traditionally known as Uluru. 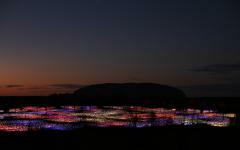 In the evening, you immerse yourself in brilliant display of light at “A Night at Field of Light” art installment, with the backdrop of the monolith. 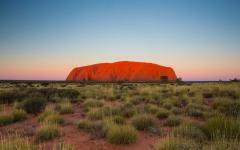 Witness the stunning changing colors of Uluru at sunrise with a picnic breakfast and tour the rock base. 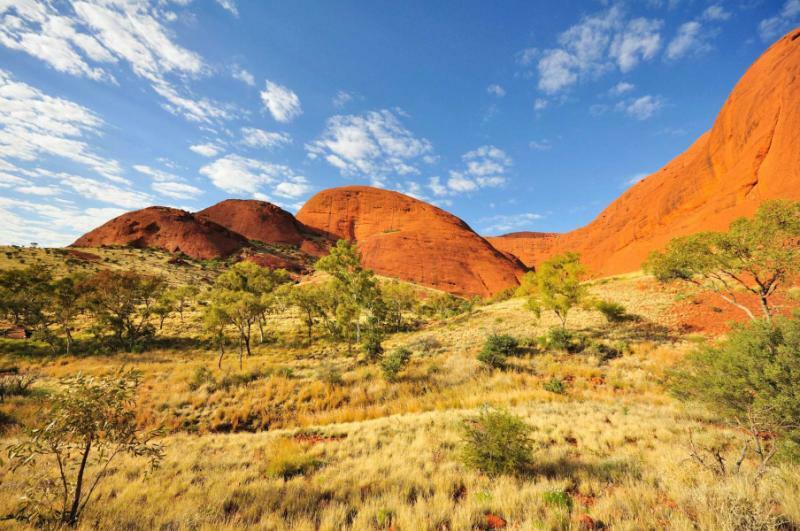 In the afternoon, you can venture to Kata Tjuta to embrace the spiritual qualities of the natural dome formations. 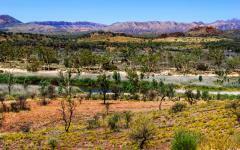 You travel to Kings Canyon and settle into a deluxe resort in view of Watarrka National Park. Follow the trails around Kings Canyon to see the staggering heights of the cliffs and sensational vegetation inside the gorge, referred to by locals as the Garden of Eden. Settle into the town of Alice Springs in the evening. You have the morning at your leisure. Visit the unique museums around town or experience a morning camel ride. Explore Desert Park to see the wildlife of the desert and learn traditional Aboriginal survival techniques. In the afternoon, you fly to Cairns. 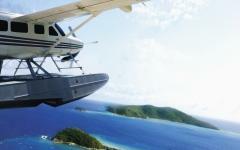 Your transfer escorts you to your lavish accommodation in the town of Port Douglas. 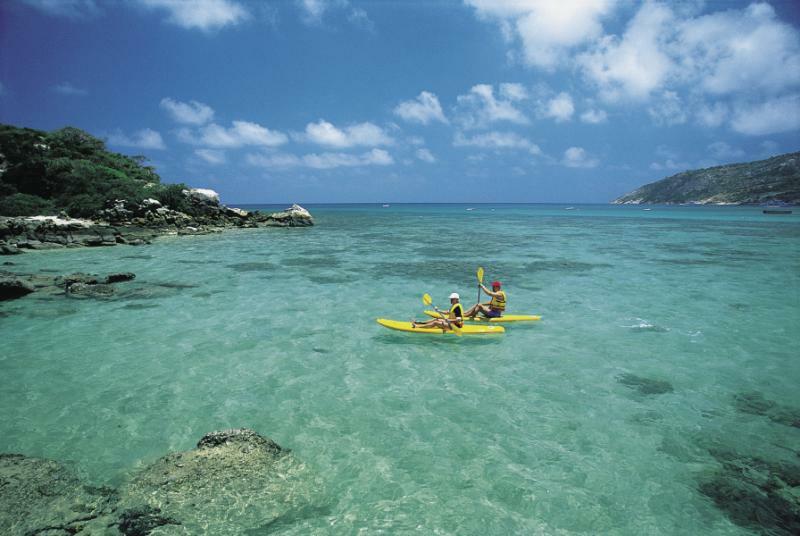 You step aboard a catamaran to explore the unforgettable experience of the Great Barrier Reef. Travel on the scenic Kuranda railway. Enjoy the charming streets of the town of Kuranda before returning to the coast with a panoramic view of the rainforest and shoreline on the Skyrail. Then, you discover the wildlife of the rainforest and the stories of ancient culture at the Mossman Gorge on a Dreamtime Walk. Your private transfer meets you at the hotel on your final day and escorts you to the airport for your flight home. Consider extending your stay in Australia, and browse some of our other Australia vacations to continue your adventure of a lifetime. Sydney is famous for its stretches of beaches lined with golden sand and lifeguards running along the shore to ensure the safety of beachgoers. Leisurely fishing boats and elegant sailboats drift along the tranquil waters near Sydney Harbour. The Sydney Opera House rises like an opulent jewel on an outcrop of land, framed by the arch of the Harbour Bridge. Your transfer greets you at Sydney Airport upon your arrival and escorts you to a luxurious hotel located in the heart of downtown. The Chinese Friendship Garden is a serene walled green space in Darling Harbour incorporating waterfalls, lakes, and exotic plants. Bright orange koi swim in the charming ponds. Pear blossoms bloom over the pathways. Weeping willows provide a slice of rural paradise in the heart of the urban culture, combining the best of both worlds. 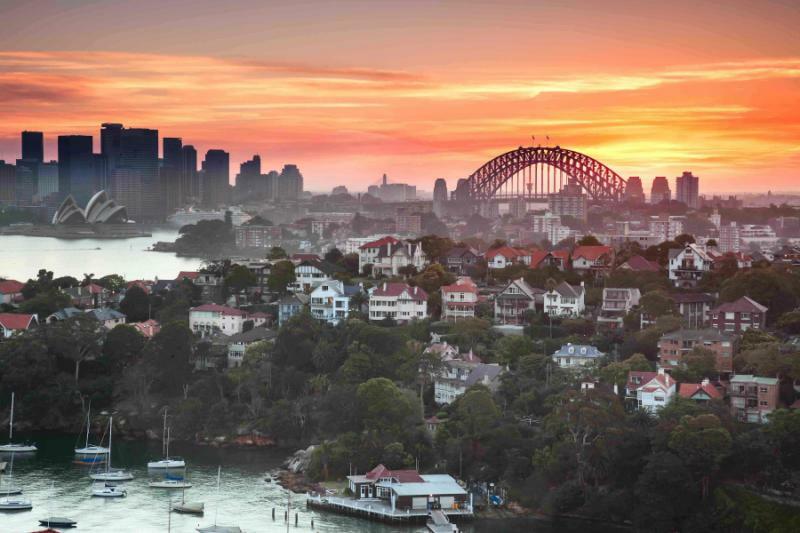 You settle into the comforts of your hotel and the embracing cosmopolitan lifestyle of Sydney. 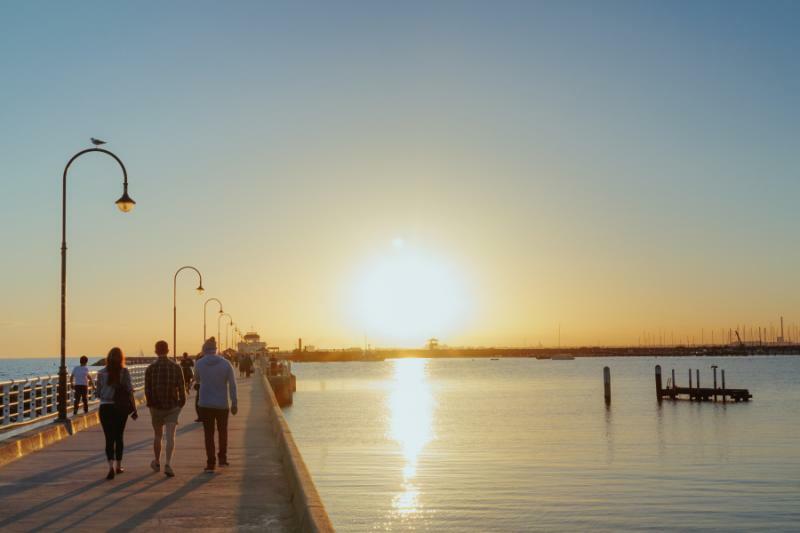 Consider learning more about the best Australia travel agents whom we partner with, and see how they are able to customize your itinerary to your meticulous desires and interests. In the morning, the calm Pacific waters lap at the boats docked in the harbor. Locals in the neighborhood of Surry Hills flock to Single Origin Roasters for an Australian breakfast with a twist. The aroma of fresh coffee fills the dining room and blends with the scent of freshly baked banana bread. You meet your guide to begin your tour of the historic Rocks of Sydney. The edge of the Sydney Harbour Bridge leads into the upper reaches of The Rocks. The original buildings were constructed from local sandstone. The façade of a vintage warehouse decorates the streets, now filled with modern boutique shops and trendy restaurants. The area showcases the creativity of blending historical importance with contemporary culture. The Fortune of War and the Lord Nelson both claim to be the oldest pubs in the city. The aroma of freshly made macaroons emanates from the La Renaissance Patisserie. A small park overlooks the boulders bordering the harbor beneath the bridge’s steel frame. It is a short distance to the famous Sydney Opera House, the most iconic image of the city. The building was officially opened in the 1970s and is known for the opulent roof imitating the sails of passing ships. The auditorium can hold over 5,700 audience members. The sound of the water brushing against the rocks surrounds the brick-paved pedestal. It is a sampling of your first concert in Sydney. 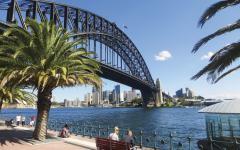 In the morning, locals and visitors venture to the celebrated beaches around Sydney. Mild Beach Vaucluse is a tranquil swimming spot with shallow turquoise water that offers an impressive view of the city. 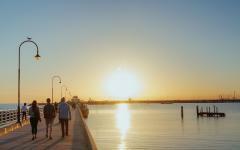 After breakfast, you make the quick and scenic walk to Darling Harbour to step aboard a fabulous cruise. 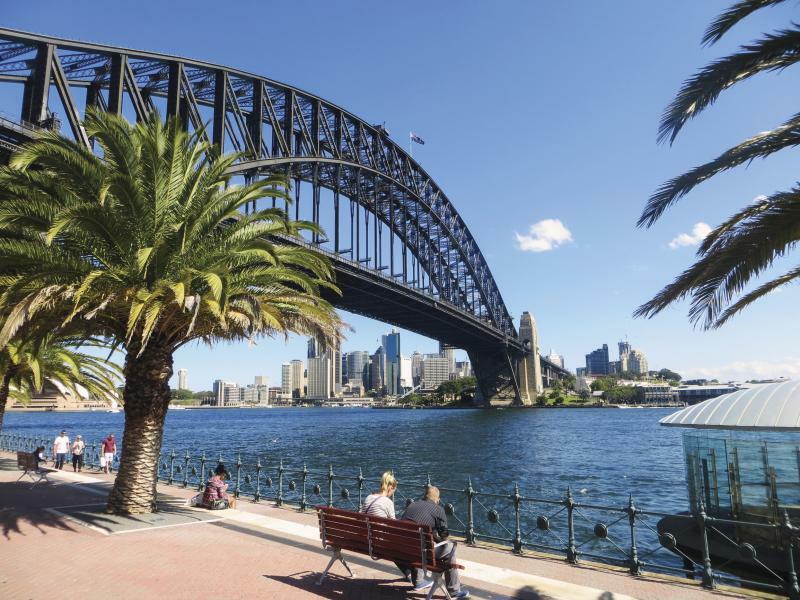 The ferry travels between Circular Quay, Darling Harbour, and the northern shores of Manly Beach, allowing you to immerse yourself in the vast borders of the city, boarding and disembarking at your preferred stops. Take in the spectacular view of the Sydney Harbour Bridge and the skyline of the city from the water. In Manly, you can rent a bicycle or stroll along the scenic walkway. Surfers set out to catch the breaks at Bondi Beach. The cafes and restaurants open their doors to the quiet sounds of the waves lapping against the shoreline. Soon locals and visitors spread their towels out along the golden sand and relax in the warm sunlight spreading across the city. After breakfast, your guide meets you at the hotel and leads you outside the city to the famous Blue Mountains. The area is a combination of mountains, plateaus, valleys, and escarpments extending from the Great Dividing Range. The sandstone bedrock protrudes from the lush tress. The gorge sinks to a depth of nearly 2,500 feet. Verdant forest overtakes the mountains. 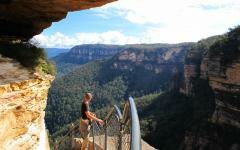 The Three Sisters is a rock formation overlooking the Jamison Valley near the town of Katoomba. The rocks rise like karsts out of the jutting landscape. The tallest formation is 922 feet from base to top. A stairway leads from the valley floor to the viewing platform with more than 800 steps. You can take the Katoomba Scenic Railway the remainder of the way into the Jamison Valley to tour the botanic garden, which highlights the unique flora of the region. The railway is the steepest train ride in the world, with an incline of 52 degrees, traveling a distance of 1,017 feet. The view of the forest canopy is captivating and thrilling. On the weekends, antique and crafts markets fill the streets of Glebe, a neighborhood populated by artists, students, and a bohemian atmosphere. Early morning cafes and late night bookstores open their doors to the bustling crowd. After breakfast, your private transfer greets you in the hotel lobby and escorts you to the airport for your complimentary flight to the Red Centre, Australia’s famous desert. Radiant blue skies offset the bright red sand. 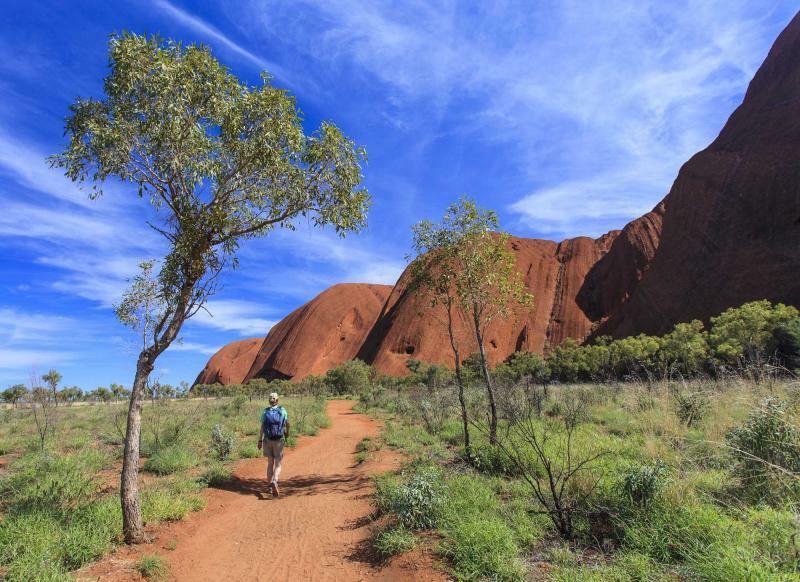 Your guide leads you to your hotel in view of the coveted monolith known as Ayers Rock, but traditionally known to Aboriginal tribes as Uluru. You can see the red walls of the rockface on the horizon, the single structure rising above the flat landscape. As the sun begins to set, a golden hue takes over the sky. 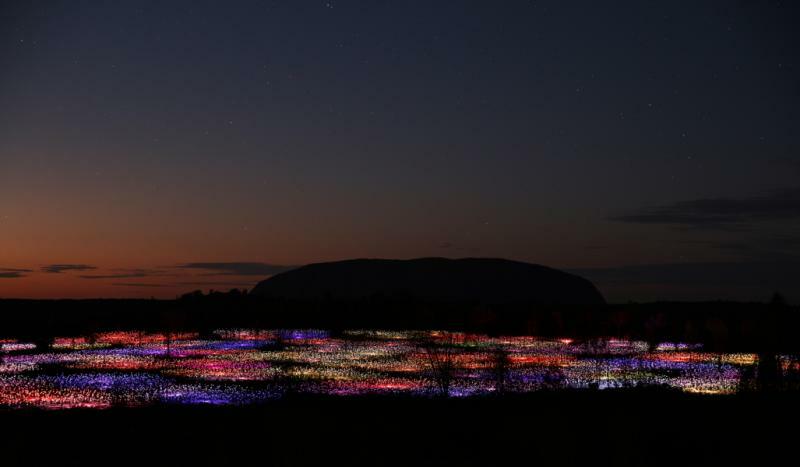 The red walls of Uluru fade to purple. 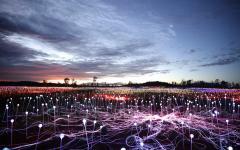 You take the evening to enjoy the art installation known as the Field of Light. Frosted-glass spheres crown more than 50,000 slender stems to create an imitation of the endless starlight in both the sky and across the landscape. The illusion is inescapable, surrounding you on all sides with flickers of twinkling light. The aroma of decadent, gourmet cuisine sweeps across the light field. The bulbs continue to glow. The stars shine brightly above. The serene desert expands beyond the light for what feels like eternity in every direction. Wake up before dawn. The starlight continues to shine above the distant monolith. The beauty of the pristine desert is astounding. 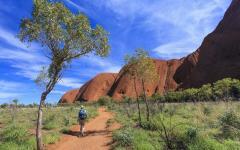 Your guide greets you in the hotel lobby and leads you to the base of captivating Uluru. The plateau stands at 1,142 feet above the desert floor. Natural caves are home to ancient paintings. Springs and waterholes fill indentations on the sandstone. When the sunlight layers the horizon, you can see streaks of vibrant red returning to Uluru’s façade until it practically glows. Your guide cooks a delicious picnic breakfast at the viewpoint. The aroma of rich coffee fills the desert air. The blanket of blue skies returns. After your meal, your guide leads you on a tour of Uluru’s base to show you the various art and stories accessible to visitors. Aborigines hold the site sacred and therefore keep various areas of the monolith off limits to those outside of the tribe. 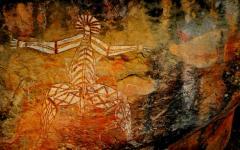 The art is a historic and scientific record of human occupation in the region, and is culturally significant as well. Your guide explains the various symbols on the rock wall, passed down from generation to generation, from the squiggly line that means a journey path to a collection of dots in a circle that symbolizes a waterhole. In the cool dawn, dingoes roam around the desert hunting. Their high-pitched yips sound more like birds than as relatives of the dog. They can grow to 24 inches tall and 61 inches in length, from nose to tail. Their fur is soft and bushy with red hues similar to the desert sand. After breakfast, you leave Ayers Rock. Bound for Kings Canyon, the monolith fades behind the horizon. Palm forests spring out of the sunken terrain inside the gorge. The canyon rim towers over the trees with a four-mile diameter. More than 600 species of plants bloom along the gorge floor. Wild camels roam across the landscape after having been relocated to the Red Desert in the 19th century to help ferry goods across the turbulent region. The beehive domes of the canyon rim are known as the Lost City. Marine fossils from an ancient ocean are continuously discovered in the rock bed, along with historic cycad ferns and river red gums populating the iron-rich desert. Settle into the comforts of your resort-style accommodation with the beauty of the tranquil scenery stretching as far as the eye can see. Today you follow your guide into Kings Canyon to explore the splendor of the Australian natural treasure. The cliffs rise more than 984 feet above the gorge floor. The trail leads you to a stunning verdant garden with plants spanning millions of years. Your guide ensures you follow certain paths. A number of trails are off limits, leading to sacred Aboriginal sites. 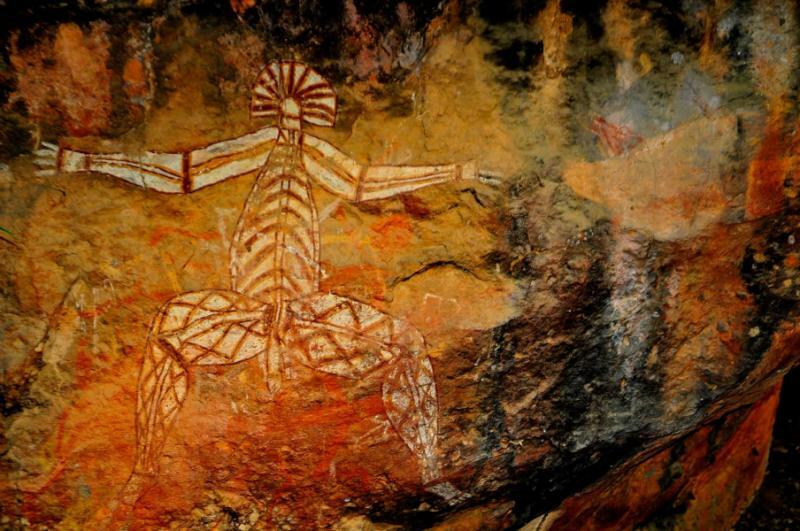 The Luritja Aboriginal tribe has called the region home for more than 20,000 years. 500 steps crown the beginning of the rim walk. The waterholes ripple with small activity, and are collected during the wet season and revered by locals for providing a valuable resource during the heat and drought brought by the desert. The sun is high and hot overhead. You can sit down with a local tribesman and learn about the traditions of the culture and the connection of the people to the land. It is more than the ancient fossils and prehistoric bushes that bring credence to the wonder of Kings Canyon, but also the spiritual characteristics between legend, history, and the contemporary world. After your exploration of the trails, your private transfer escorts you to Alice Springs, the third largest town in the Northern Territory. Alice Springs is an oasis in the sweeping open landscape of the Red Desert. 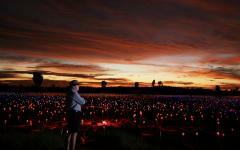 It remains one of the Outback’s most famous towns, filled with rugged beauty and continuing the mythical qualities carried over from your time at Uluru. 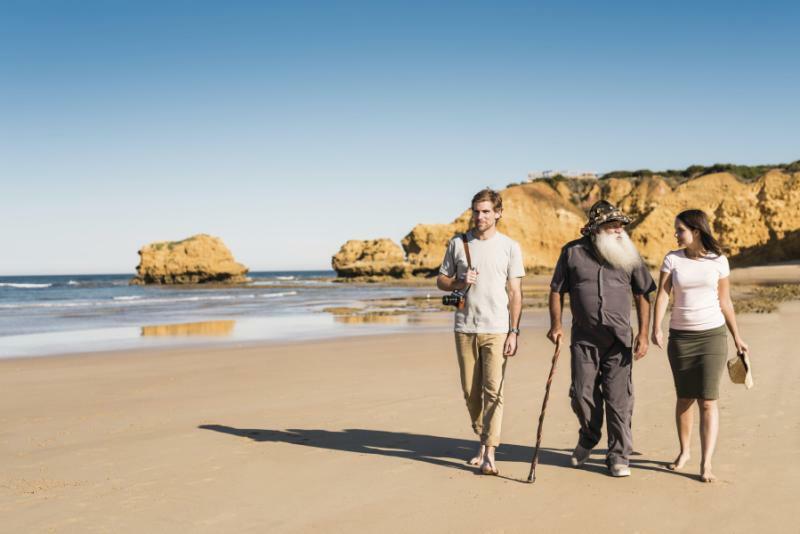 A vibrant Aboriginal culture blends with Australia’s pioneer past. White gum trees grow and glow against the background of oxidized sand. After breakfast, you can enjoy an experience at Desert Park. The open-air exhibit recreates the natural environment of many of the desert dwelling fauna, including marbled velvet gecko and the spangled grunter, a blue fish with a silver sheen and reddish spots. An inland river, sand country, and sparse woodland help recreate the ecological variations spread across the desert territories. Wedge-tailed eagles showcase their unique hunting abilities and rabbit bandicoots provide insight into the unique shapes and sizes of Australian marsupials. The park covers more than 3,200 acres and presents an opportunity to engage in learning about Aboriginal Survival techniques. 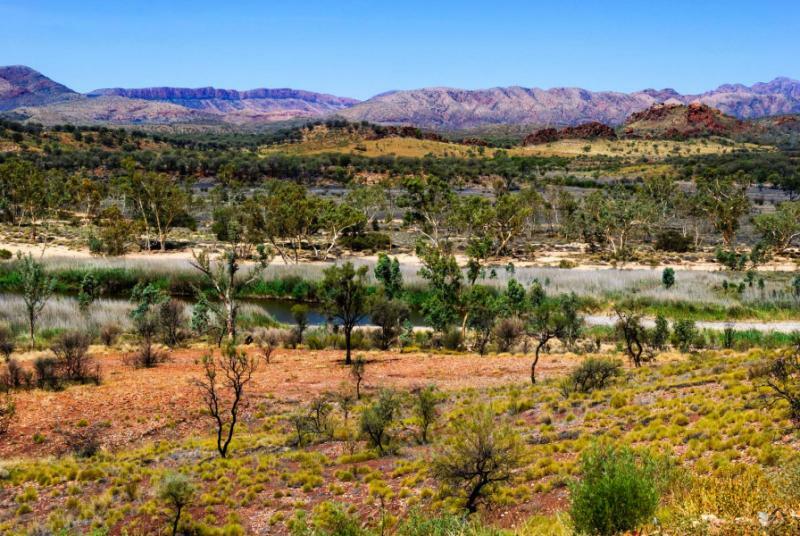 Learn how historic and contemporary Aborigines of the Arrernte tribe gathered water and food resources, along with the roles of men and women. You listen with intent on the importance of a “Skin Name,” a kinship system that builds upon social organization. 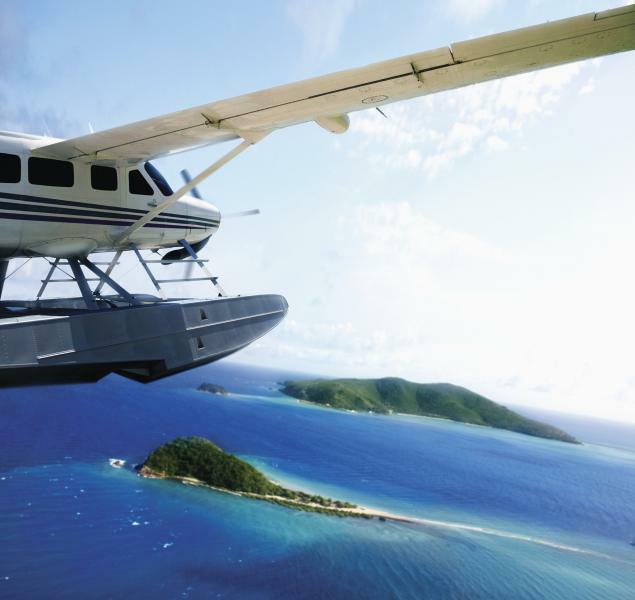 In the afternoon, your private transfer escorts you to the airport for your flight to Cairns in the northeast of Queensland, where you settle in the luxuries of your resort in the town of Port Douglas. In the morning, the Pacific Ocean laps at the stretch of white sand on Four Mile Beach. The turquoise water shines in the drifting sunlight. After breakfast, you make your way to the marina and step aboard the 95-foot luxury catamaran. The ship is designed to take small groups to three special locations along the outer Agincourt Reef. 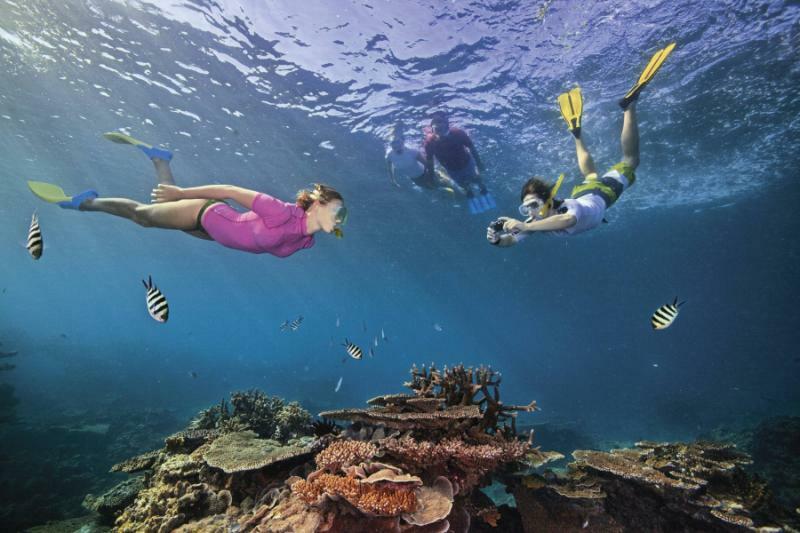 The Great Barrier Reef encompasses 133,000 square miles, and supports a diverse ecosystem of marine life, including 600 different types of coral. 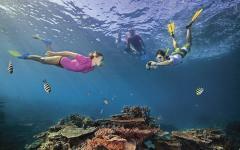 You reach your first destination and jump into the water, eager to view the celebrated underwater world. The Pacific is refreshing. You can see down to the reef below. Soft coral billows in the current like leaves in the breeze. Hard coral rises like mountains and hills stretching across the seafloor. The life beneath the water is vibrant and breathtaking. Seahorses can change their colors to blend into the coral. They wrap their tails around narrow openings and flutter their fin-like appendages to keep steady. Clownfish poke their heads out of sea anemones. Their bright orange and white colors stand out against the glowing light purple tint of the anemone’s tendrils. The aroma of mango trees drifts from the verdant canopy and mixes with the semi-sweet scent of the Pacific Ocean. Queensland is the only place in the world where two UNESCO World Heritage sites meet. The edges of the Great Barrier Reef touch the bordering trees of Daintree National Park. After breakfast, you venture into the stunning rainforest on a scenic train ride to the town of Kuranda. The railway meanders through the trees, venturing up hills and alongside the limestone cliffs, traveling more than 21 miles on a 100-year old path. Reach a height of 1,076 feet above sea level. Outside, you can see the lush canopy sweeping across the landscape and filling a steep gorge. A stunning waterfall cascades down the cliffs, meeting the river below. The town of Kuranda has a bohemian, artistic vibe nestled inside the rainforest landscape. The markets fill with the aroma of sandalwood and showcase the variety of handmade crafts created by local artisans, from honey wines to ice cream, jewelry to colorful ceramics. Djurri Dadagal Art Enterprises displays indigenous work through a cooperative run by a community leader. Paintings and artifacts decorate the walls alongside marvelous didgeridoos. The town is colorful and vibrant. 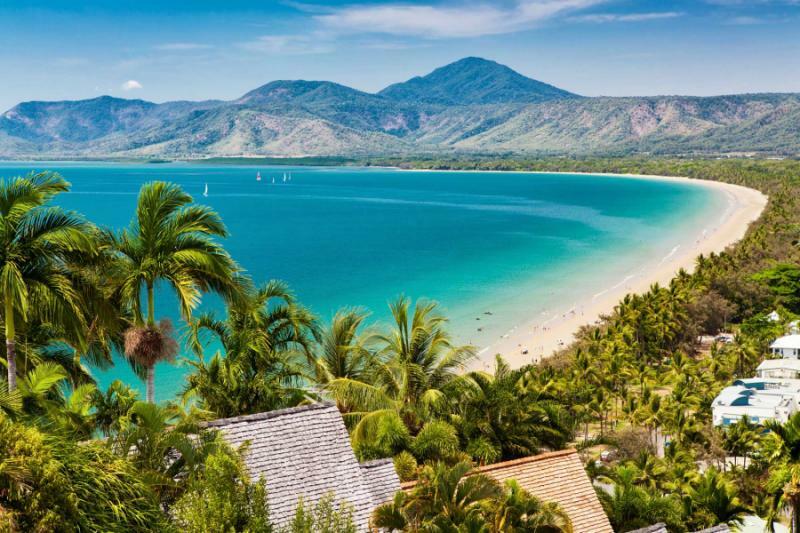 When you are ready to return to Port Douglas you board the Skyrail, a gondola nearly five miles long that hovers tens of feet above the forest canopy, where you have an unadulterated panorama of where the trees meet the coast. Today you once again venture into the rainforest, eager to explore the depths of its beauty and mystique. You make your way to Mossman Gorge. Light filters through the dense canopy. Green-eyed tree frogs blend into the leaves. Monitor lizards lounge on boulders near ponds. The elusive but distinctive cassowary, a large bird similar to an ostrich in size, roams through the trees. Their blue neck and face contrasts their glowing red eyes. They resemble a dinosaur more than a bird. The gorge remains the homeland of the Kuku Yalanji, an indigenous tribe who help preserve the integrity of the land and their culture across the rainforest. Your guide meets you at the trailhead and includes you in the traditional smoking ceremony, used to cleanse locals and visitors alike of evil spirits. Your guide regales you with traditional legends of the Kuku Yalanji people while pointing out the distinctive flora and fauna of the region. At a sacred ceremony site, you meet with local tribesmen who introduce you to the sounds of the culture, blowing the deep humming rhythms of the didgeridoo. 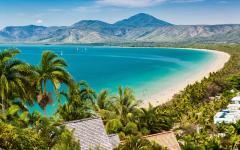 Port Douglas has a serene setting and a quiet ambiance. 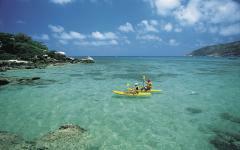 The village-like quality of the town opens to the lulling turquoise waters of the Pacific. Palm Trees shade the edges of the beach. Locals and visitors relax on the soft white sand of Four Mile Beach and enjoy the warm sunlight. In Cairns, locals like to stroll along the esplanade. Families spend time in the Cairns Esplanade Lagoon, a 51,667 square foot saltwater swimming facility with a pristine view of the ocean. Cafes open their doors to the drifting sunlight. Flying foxes sleep in the trees during the day, dangling upside over quiet walkways. After breakfast, your transfer meets you in the lobby of your hotel and escorts you to the Cairns Airport for your flight home.